Compensators are one of the best attachments you could stick on your 1911. The pistol is known for its decent vertical kick and reducing that can only lead to a more comfortable shooting experience and better accuracy at range. What’s not to like? Let us help you find the perfect compensator for your 1911 with this handy guide. What is a Compensator and What is it Used For? A compensator is an attachment for the end of your 1911. It can be installed by you if you have the skills or if it’s a model that’s supposed to be easily installed, or by a professional gunsmith if you want the best possible job done on your firearm. When you fire a firearm, the gas explosion at the end causes your muzzle and barrel to kick upward. This can negatively affect your accuracy, especially if you intend to try to make quick follow-up shots. 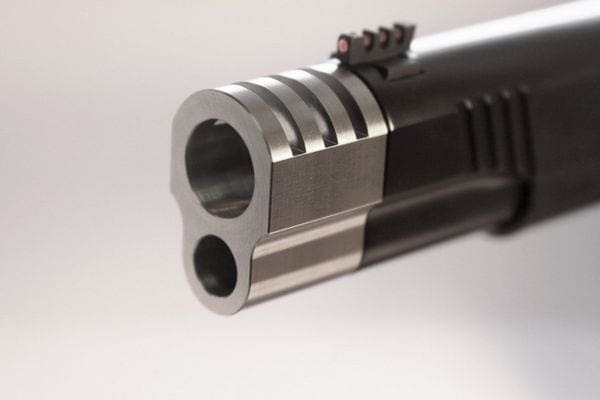 A compensator redirects this gas outward or down beneath the barrel, causing the recoil to be more evenly spread and your 1911 to kick upward less vigorously. This will have a positive effect on your accuracy. Note that this does not reduce recoil; it merely redirects it to a more constructive direction. You need to be careful not to have your hand near the 1911’s barrel, too, since the gas and energy is being moved away from the direct front of the gun. This means that your hand could get burned if it’s too close to the emission source. Are All Compensators The Same? Not all compensators are the same. They can differ by make, material, weight, and where their gas outlets are actually located. For instance, traditional compensators extend the overall length of your gun by attaching to the end of your barrel, while bushing compensators fit over your barrel and don’t extend its length. 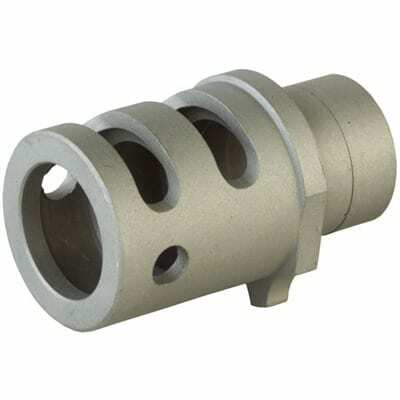 Some compensators have additional features, such as threaded barrels. These can continue the threading pattern you might find in your 1911 barrel, which can preserve the accuracy of a round as it continues to travel the extended length of the barrel and compensator. Others fit more or less tightly to your weapon, and this can also affect accuracy. Basically, like with every gun attachment, there are good and bad compensators and we’re here to help you find the good ones. Let’s go over what makes up a good compensator before we dig into our personal favorite picks. These are the most important factors when it comes to selecting the best compensator for your weapon. These will actually affect how it improves or decreases your 1911’s performance, so pay close attention and watch for these features as we go over our top picks. Compensators with a hefty amount of weight will help decrease vertical recoil as you fire. Look for something that has a good weight to it, but one that’s also not so heavy as to negatively impact your accuracy. 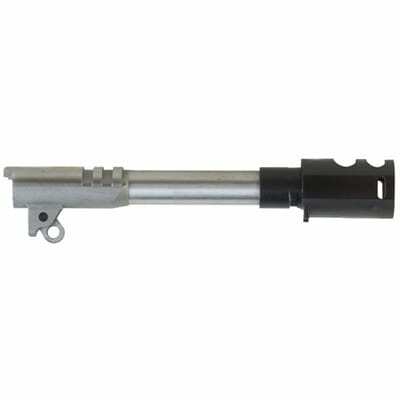 Some traditional compensators have threads to continue the spin of a round as it exits the barrel. This can further extend your accuracy and is a great passive benefit you should look for if you decide to settle on a traditional compensator. Some compensators are easy to install alone, while others require the skilled hand of a gunsmith. A gunsmith visit requires time and money, but you might find that the expertise results in a better fit than you might have managed alone. This is largely a personal preference, as there are good and bad compensators that make use of both installation methods. Traditional compensators are favored among a lot of 1911 enthusiasts since they extend your barrel length and round range and can be threaded. The added weight and balance also make recoil easier to handle than ever. Bushing compensators tend to be cheaper and can add to a sleeker appearance for your weapon but will often be a little less effective at managing recoil than their traditional counterparts. Now, let’s take a look at our favorite 1911 compensators. We’ll explain what makes each of them unique and worth your time and money. This compensator is among the best due to its amazing spread of perks. For one, it’s very easy to install; there’s no need to take an expensive trip to the gunsmith. All you have to do is screw it on tightly and secure it afterward. The compensator does a great job of reducing vertical recoil by pushing the gas away from the front of the barrel. It’s been treated to resist heat and corrosion, which both improves its anti-recoil effect and preserves its lifespan. The compensator is of a good weight and balance, and since it’s a bushing-style it won’t extend the length of your barrel at all, preserving your gun’s look. However, it does come in an odd color that may not jive with your desired feel. Although you can always paint over the piece before you install it, so this is a really minor flaw in our eyes. This is an effective, affordable attachment that any good 1911 enthusiast will appreciate. Although it’s a bushing-type, it does an excellent job at reducing recoil and is super easy to install by yourself, no gunsmith needed. It’ll resist heat and corrosion, too, thanks to its special coating. This is a combo kit that has both a compensator and barrel. 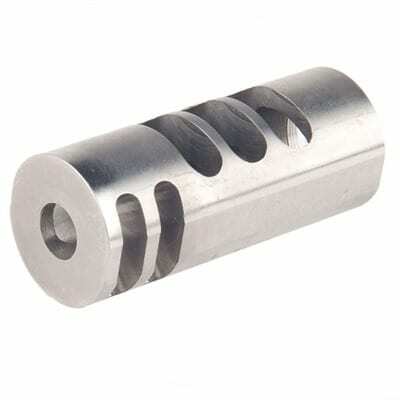 The bushing compensator is pre-fit for the barrel, so this is a great pick if you’re putting together your own custom 1911 and have yet to pick pieces for those two slots in your build. The compensator is great at reducing your overall recoil and the barrel is a match-grade variety, designed to improve speed and accuracy at long ranges. This does mean that if you plan to use the compensator with a different barrel, a little gunsmithing might be necessary to make sure that everything will fit together naturally. However, since these come in a pair, we think using them together is the natural way to go. The two pieces are made with excellent quality materials and are easy to install. Once again, no gunsmith visit is necessary. For the money that you spend, you're getting some incredible value considering that these two pieces are about a third of an entire 1911. However, this kit will have less value if all you need is a compensator by itself. In that case, you should look elsewhere. This is actually a barrel/compensator duo kit that provides both pieces for a great bargain. If you’re putting together your own custom 1911, you’ll definitely want to check this out. 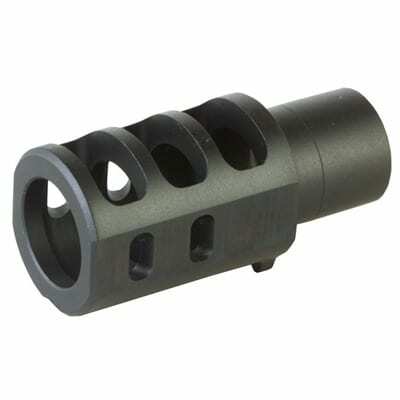 The compensator is pre-fit for the barrel and both pieces are designed to last. Install them on your own without having to visit a gunsmith. Here we have a great addition to any government-style 1911. It’s been machined to fit the precise shape and size of most government-length barrels. If you already have a 1911 in this fashion, you’ll want to consider this piece for the aesthetic aspect alone. But even without the aesthetics, it’s a great piece. It has a lot of exhaust ports and chambers to release as much gas and recoil energy as possible, negating a lot of the poorer aspects of a bushing-type compensator. This will allow you to retain the slim appearance of a government 1911 while still having some exceptional recoil control. Installation is easy without a gunsmith, although you should be careful and use a rod to be sure that you have everything aligned as you put the piece on. Some minor fitting might be required after the fact, especially if you aren’t using a government barrel or frame. However, if you do fit these criteria we can think of no better compensator. This is a bushing-type compensator that does a great job at reducing recoil and fitting the aesthetic vision of a government-type 1911. It’ll allow you to make or finish the gun you’ve always dreamed of having while still providing you with some great accuracy-boosting benefits. The installation is easy here, too. This is a traditional-type compensator, so it’ll rest at the end of your barrel and extend the overall length of your weapon. As we discussed, this has several benefits, namely that it improves your accuracy at range and does a better job of reducing vertical recoil than most bushing-type compensators. This compensator also has a threaded interior, so the bullet you fire will continue to spin for a fraction of a second longer. This will improve your accuracy even further, resulting in gains that you’d previously only dreamed of. It feels wonderful to shoot a 1911 with a compensator like this one, which has a good weight and feel without being too bulky. This is due to its titanium construction, which is durable but balanced. The price is a little high, but this ensures quality and performance. It’s an ideal addition to any 1911 that you intend to push to the maximum reaches of its effectiveness, such as during a marksmanship tournament against other, more modern pistols. Whatever your need for a compensator, we’re sure that everyone will appreciate just how excellent this particular model is. 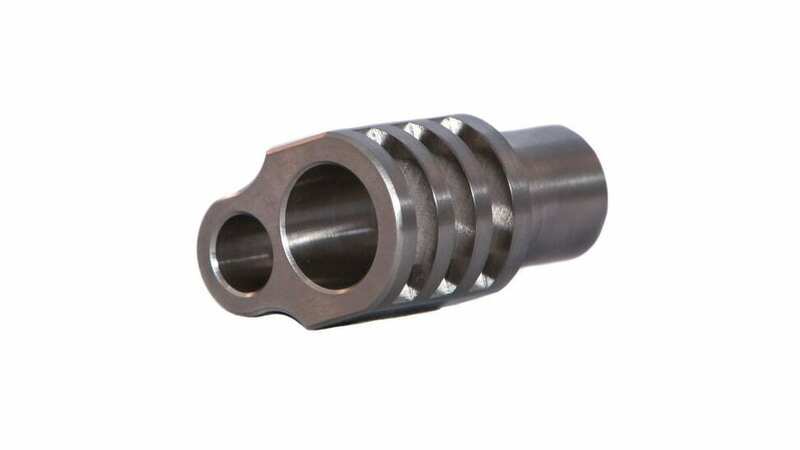 This excellent traditional-style compensator improves accuracy, range, and stability. It has a ton of ports for expressing gas and energy and is made from titanium. This causes it to be properly weighted without going overboard. Although it’s pricey, it’s well worth the cost, especially because of its threaded interior. 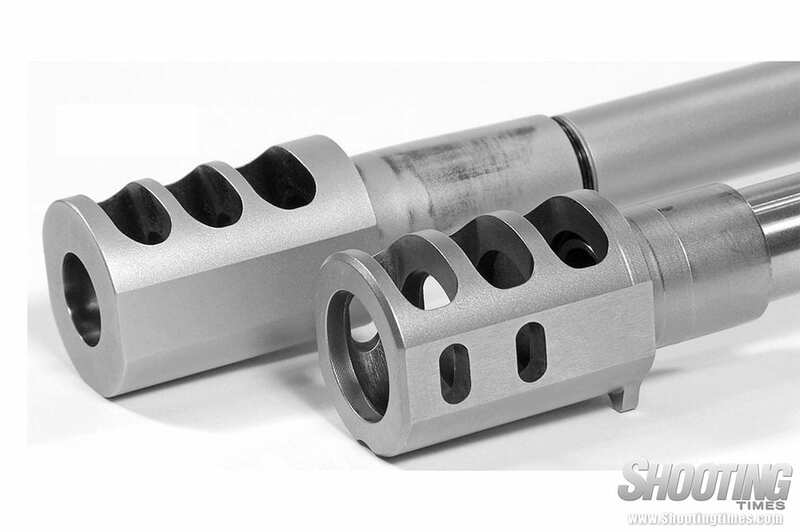 Finally, take a look at this compensator/muzzle brake from Tactical Precision Manufacturing. It’s a traditional-style, so it’ll carry all the range and accuracy benefits we discussed previously. It’s not threaded like the last compensator we looked at, but it does still improve your accuracy passively, particularly when you’re firing a lot of shots in rapid succession. It’s made to be long-lasting as the durable titanium construction materials are designed to resist heat and trauma and should provide protection for the compensator for a long time to come. You also don’t need a gunsmith for this piece, as it’s easy enough to install with the right tools. Whereas most of the time some extra weight is just another good method of reducing vertical recoil, in this case, it's a little too much and we found that it's a bit too heavy to be useful. However, with all of the other factors considered, we still think this is an excellent compensator that can be yours for a pretty reasonable price. This is a compensator that’s a little heavy for our tastes, but it’s a durable, titanium-built piece that’ll provide wonderful recoil control for your vertical direction. Since it’s so tough, it might be a great pick for outdoor trips or long excursions when you aren’t sure when you’ll be able to perform repairs. If you find the 1911 a little unwieldy, consider installing a great compensator like the ones listed above. You’ll find an immediate difference in both your accuracy and your speed. With any of these, you’ll be able to put down multiple shots so much more effectively than without a compensator. Thanks for reading!